The main floor and meeting room of Red Men’s Hall will display antique collections from our members and whimsically decorated trees. The stage is filled with Matt Roan’s standard gauge trains and village. On Saturday young musicians will play the grand piano and on Sunday visitors will be entertained by Festival fiddlers. 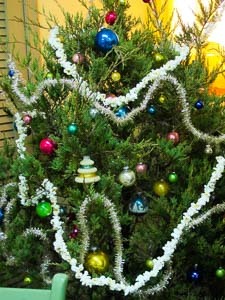 Traditional 19th century decorations festoon the Country Store. Tradition has it that the storekeeper gives a free orange to each good child who visits the Store….Or is it the Belsnickle?? You’ll have to come and see!!! The Folk Life Museum has special seasonal displays and docents will be ready to answer visitor’s questions about all the exhibits. Beautiful handcrafted items are for sale. New craftspeople have joined our regulars this year and the selection of gift items must really be seen to be appreciated. We have several tables of vintage, collectible Christmas ornaments, decorations, toys, vintage books and postcards as well as our own Goschenhoppen books and cards. All of the items make wonderful gifts for the season to either give or keep for yourself. Never to be missed is the Bake Sale and Kum Esse in the basement boardroom. Our membership does us proud every year with the variety and quality of cookies, pies, cakes, breads, chow chow, pickles, jams, jellies, and candy. 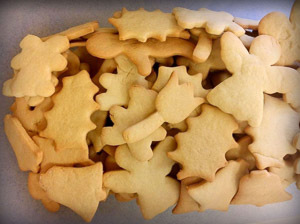 The Antes House mascot George the Grun Sow will be on display with his own sand tart cookie children. The Peanut Roaster will be roasting fresh peanuts and chestnuts. The Huckster will have fresh greens for sale either already be-ribbon or in loose bundles for you to make your own decorations. Make sure to stop into Reed’s Barber Shop next door to the Country Store. 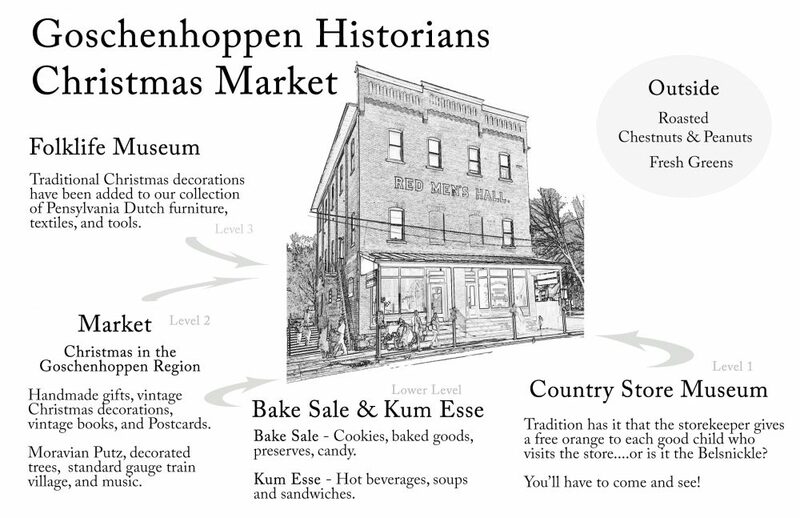 Visit the Schwnkfelder Library and Heritage Center and the Mennonite Heritage Center for more Christmas Market fun. In the evening enjoy candlelight tours at the Henry Muhlenberg House and Peter Wentz Farmstead (Peter Wentz, Saturday only). The Schwenkfelder Library and Heritage Center is featuring sales of local artwork and crafts. Be sure to see their ever evolving Putz. 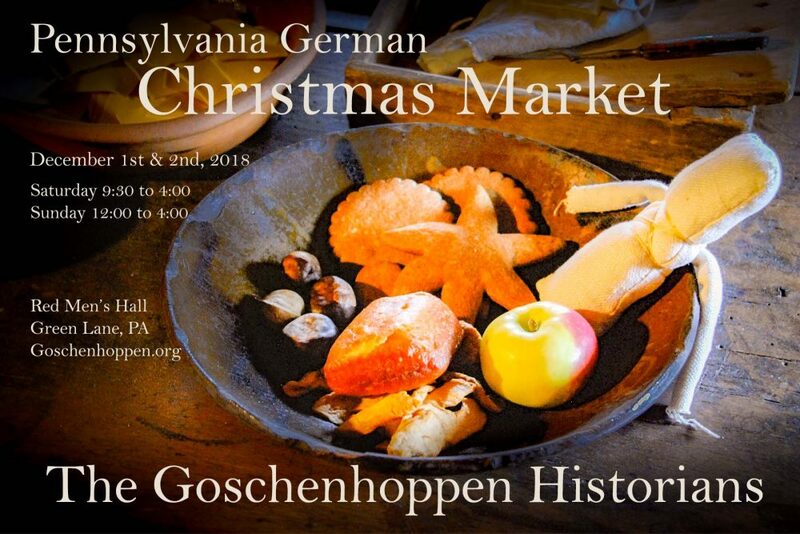 The Mennonite Heritage Center will feature special holiday exhibits and their annual Pennsylvania Dutch Folk Art sale from the finest traditional craftsmen’s wares. Join our friends at the Peter Wentz Farmstead the evening of Dec. 2 for a candlelight tour and at the Henry Muhlenberg House December 2nd and 3rd. Visit websites for hours and more information.